(ARA) – Don’t give up on getting together outdoors just because the weather is cool. Home improvements that keep you and your guests warm can make outdoor spaces comfortable even when the temperature dips. * Consider enclosing your existing patio or adding a sun room. Both structures will allow you and your guests to enjoy the views of your fall, winter and spring landscape while being safely shielded from the worst of the weather. If either option is beyond your budget, an enclosed gazebo is an excellent lower-cost alternative. Remember the best orientation for any of these additions is a southern exposure to allow you to soak up the winter sun. * An patio heaters can make your open patio or deck comfortable almost year round. Choose from portable or permanent models that use natural gas or propane. Be sure to follow the manufacturer’s safety instructions when installing and using your outdoor heater. * Similarly, fire pits can add both warmth and ambiance for cool weather gatherings outdoors. Wood or gas models come in a variety of styles and sizes, from classic chimney pots to open fire pits. If you’re using a wood-burning model, it is a good idea to include a spark arrestor. * For the ultimate outdoor entertainment, borrow a page from ski and snowboard enthusiasts who warm up and relax in an outdoor hot tub after a day on the slopes. 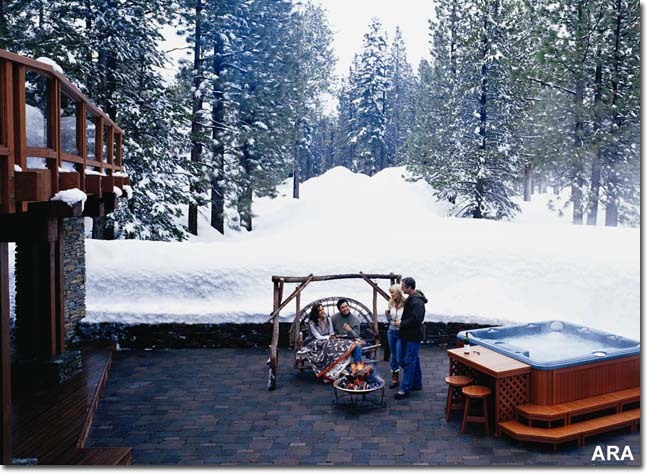 Heated hot tubs provide a warm and inviting gathering place when temperatures are frosty. Self-contained models make it easier than ever to enjoy the hot tub experience in your own back yard with easy installation and maintenance features like advanced filtration and ozone water purification. Hot tubs with a wireless digital readout, that you can keep inside, let you check the water temperature before you even leave the house – a must-have feature when there is a chill in the air. You can also minimize the time you spend outside in a bathing suit on a cold day by placing your hot tub near a back door. Other features make modern hot tubs a true backyard entertainment center. Look for models with stereo entertainment systems complete with docking stations for iPods and other portable media devices, multi-color rotating LED lighting and floating remote controls. For backyard installation ideas that will help in home improvement plans, visit www.jacuzzi.com or www.sundancespas.com.